action) 1917, leaving a dau.. Cicely Noel. 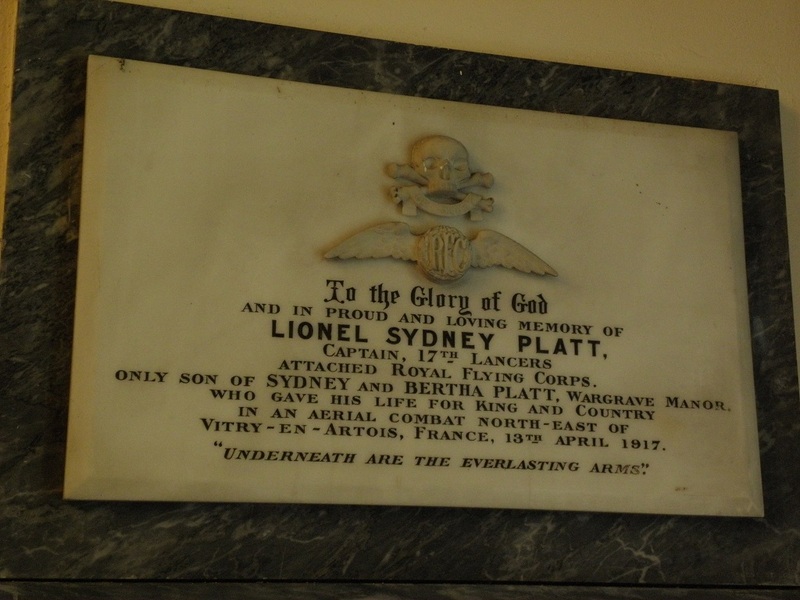 Additional information: Son of Sydney and Bertha Platt, of Villa Beatrix, Pau, Basses Pyrenees, France; husband of Gillian Mary Platt (nee Spencer Warwick). Grave/Memorial Reference: V. F. 4.
flying a F.E.2d machine No A 5150, engine no 4/250/89 and carrying Lewis Guns. They failed to return and were reported missing, but were subsequently reported by the Germans as killed. 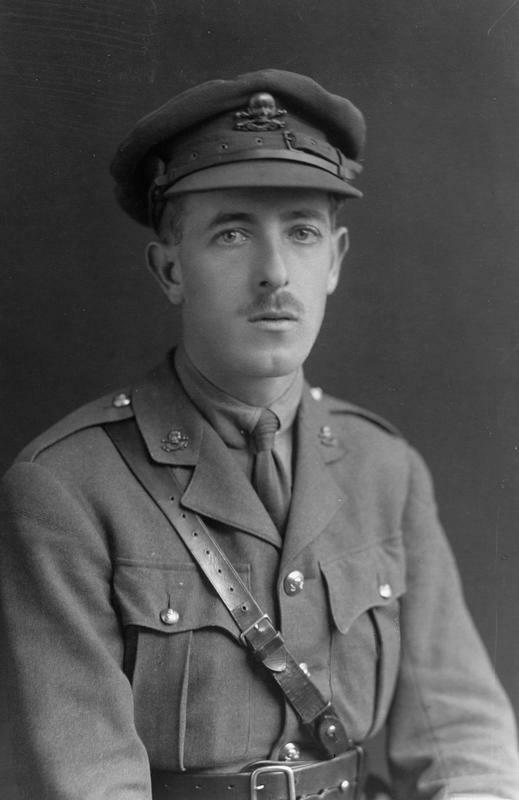 I am to state that the patrol comprised six machines of number 57 squadron, two of the machines returned with engine trouble without seeing any enemy aircraft: one made a forced landing west of Arras, another lost the formation and encountered eight enemy machines which refused contact. The remaining two did not return. No general engagement of the patrol, therefore would appear to have taken place. in reply to your enquiry of the 7th inst. respecting Capt. L. S. Platt and Lieut. Margerison attd. R.F.C., we regret to say that the following reports appear on lists dated 20.8.17 from Berlin. "Platt L.S. Capt R.F.C. died 13.4.17." "Margerison Liet. R.F.C. died 13.4.17." In addition to the above report respecting Capt. Platt we may state that a letter from Berlin informed us that this officer died on the date mentioned at 9.30 near Vitry in Artois. In reply to you letter of Sept 3rd re my letter of June 29th to Mr. Platt on the subject of Capt. l. platt and Lt. Margerison reported missing, I beg to say I have no further information to give you than that enclosed to mR. Platt as received by me in a letter of June the 27th from the Agence Internationale des Prisoners de Guerre, Croix rouge de Geneve. This information was as follows. "Capt. L. S. Platt of lancers ainsi que Lt. Margerison 1st Huntingdonshire Cyclists ont ete abattus mourant dans un combat aerien an Nord Est de Vitry en Artois le 13 Avril 17. a 9 h du matin. Nour regrettons que nos enquete ont abouti a un resultat si triste." The reference No. of my correspondence with the Red Cross was E 48061. Address at time of WW1 was St Bruno, Sunningdale. 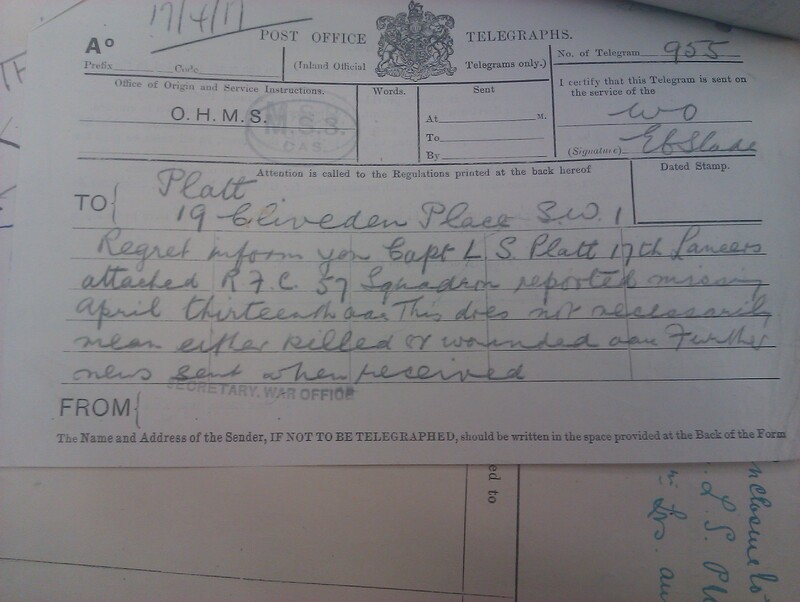 War Service record Reference: WO 339/6363 National Archives, Kew.